A candle that you can light for a few minutes to use the melted wax. Before you can create the daisy you will need to prepare the yogurt lid for use. Make cuts all the way around the yogurt lid about 1/4 inch apart and about 1/4 inch deep in toward the center. (Each little section between two of the cuts we will call "tabs".) Also make an X cut in the center of the lid. Take your 1/4 inch wide, white ribbon. With the top of the yogurt lid facing up, send the end of the ribbon through the X in the center of the lid. Pull about 3 inches of the ribbon through the X to the underside of the lid. Hold the ribbon at the center of the yogurt lid, measure out 3 inches from there and cut the ribbon. Thread the ribbon down through the center X in the lid. Thread the large needle with a piece of the 1/8 inch yellow ribbon that is about 20 inches long. Position your needle on the other side of all the ribbon in the center (going over it) and just to the left of the 6 o'clock petal. Now, position your needle on the other side of all the ribbon in the center again and just to the left of the petal that comes after the 6 o'clock petal going in a clockwise direction. Continue in this manner, going clockwise around the petals, over and under the center ribbon until you reach the point where you started. Once you reach that point, continue on to about 3 o'clock so that you overlap the place where you started a little bit. Send the needle and ribbon down through the center X on the yogurt lid and pull tight. Leave about 3 inches of ribbon at the underside of the yogurt lid and cut the ribbon. To finish the daisy, hold all ribbon ends below the yogurt lid. Pull down each tab and slide the ribbon off of the tab. When they are all off, pull the ribbon ends out of the center X hole. Tie all ribbon ends together in a knot two times and trim the extra off. Before you begin creating the rose, light a candle and let it burn until there is a little pool of liquid wax around the wick. This will be used to help keep the cut ribbon ends from fraying while you work. Cut a 6 inch piece of 7/8 inch wide, pink ribbon. Thread your needle with pink thread and tie a knot at the end. Put a running stitch along one 6 inch edge of the ribbon and leave at least 3 inches of the thread at the end of the ribbon without tying a knot. Do the same thing to the other 6 inch edge. Roll the ribbon in a spiral tucking the corner edges of the ribbon toward the rose center so they do not stick out. Using your needle and some pink thread, make a few stitches in the base of the rose and along the end of the ribbon that is on the outside to hold the rose in its position. Cut three 10 inch pieces of ribbon in shades of blues or violets. Tie the three pieces together on one end to be the top of the flower. Tie the left ribbon and the center ribbon together loosely up against the knot. Next, tie the center ribbon and the right ribbon together loosely up against the knot. Then go back and tie the left ribbon and the center ribbon again. Continue tying the ribbons together loosely in this manner until the tied ribbon measures approximately 1 or 1 and 1/2 inch in length. Complete the flower by tying all three ribbons in a knot together at the base. Tie a piece of green ribbon to one of the pieces of blue ribbon. Trim all ribbon ends including the ends at the top of the flower. Arrange your flowers on a supportive type surface. We used a basket. 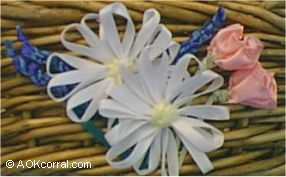 Use a hot glue gun to attach the flowers to the basket or other surface. You could also sew them on to fabric surfaces. Try making these flowers in different colors to create the seasonal look you want. Use your imagination to find different places to use them such as on name tags, baskets or even gift boxes! © Copyright 1999-2004 by AOK Corral Craft and Gift Bazaar. All rights reserved.